White cotton with snap. Comes in M, L or XL. Sold by the dozen. White nylon. Comes in M, L or XL. Sold by the dozen. 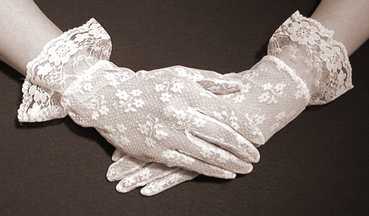 White thin gloves. Sold by the dozen. 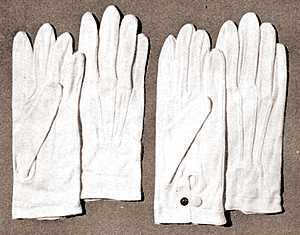 White regular gloves. Sold by the dozen. 40 page pocket sized booklet. 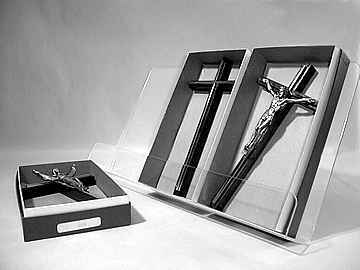 Hebrew and English versions of all important prayers, memorials, graveside meditations for family members and friends. includes Yiksor calendar, the Jewish -English calendar through 2006, answers to frequently asked questions about mourning. 3 1/4" x 5". Brown cover. Prescribed for post burial use.Guaranteed to burn for a minimum of 168 hours. Satin type yarmulkes, unlined. 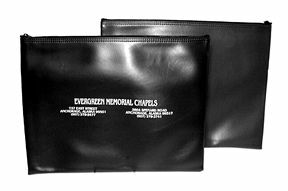 Comes with funeral director's imprint inside. 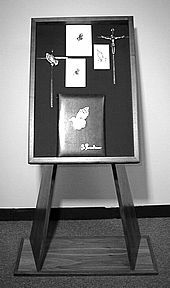 Leather grain portfolio holds vital papers. Zipper closure, 12" x 16". White or black imprint. Available in: Lake Blue, Peanut, Paprika, Persimmon, Pure White, Eggshell, Ghost Green, Sugar Brown, Antique Gold, Emerald, Dark Blue Wedgewood and Black. 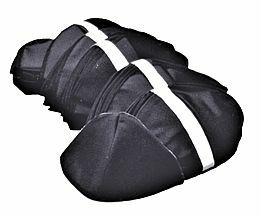 Protects flag from dirt, dust and moisture. See-thru plastic front, blue plastic trimmed in red. full width zipper. triangular shape holds traditionally folded flag. 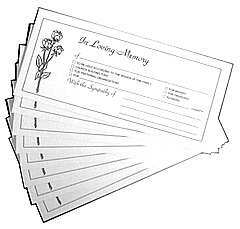 Spaces for family to record all data pertinent to the deceased. Information for preparing death certificates and other forms required by law. 8 pages. Comes with imprint. All necessary statistics compiled on compact card. Fill out for clergy who may be unfamiliar with deceased. 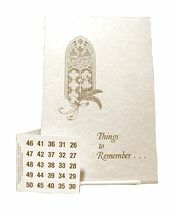 Embossed in gold with gray printing. 1 line imprint. C237/560 4 1/2" x 10"
Record plot information. Space for record of interments with extra deep flap. 5 line imprint. 12 Pages to record actions and services of friends. 1 page of numbered stickers for identification. "etiquette of Acknowledgement" at end of booklet. Free imprint. For organizing vehicles and occupants. Space for Pallbearer's names and for listing occupants of cars. has 3 line imprint. 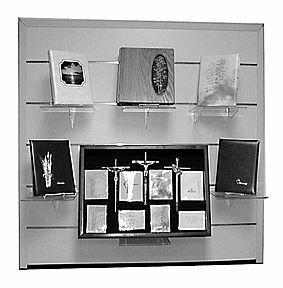 B137/3607 4 3/4" x 3 1/4"
Pre-printed messages for visitors use when making a memorial contribution. 100 per box. Saves personnel time by instructing each member of cortege to turn on head lights. Comes with 3 line imprint. 11" X 3 1/2". Tape inside or out. please specify. A coloring book designed to help children cope with the loss of a family member or friend.